Kauai is known worldwide as the “Garden Island,” and for good reason. Not only is the isle a botanical paradise in itself, it’s home to several highly acclaimed professionally managed gardens. We’ll look at four of these magnificent properties in this post. Each is well worth visiting during your upcoming vacation. 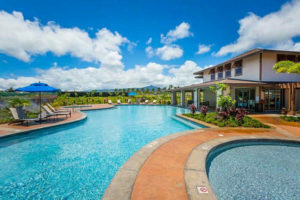 And, when you combine a tour of Kauai’s gardens with a stay at our world-class resort and spa, you get the very best getaway package available anywhere, all for an affordable price. So, without further ado, let’s explore the gardens of Kauai. Sign up for tips and deals on your Kauai adventure! You’ll find this astonishing natural wonder nestled along Kauai’s southern shore in the Lawai Valley. 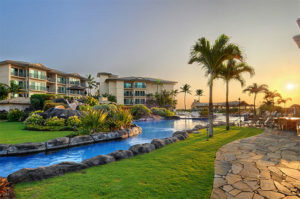 Originally founded by a member of Hawaii’s royal family, the site includes a pair of gardens situated between a crystal stream and the valley’s magnificent cliffs. Expert gardeners lovingly maintain the thousands of flowering bushes, fruit trees, and other examples of tropical plant life that thrive in the local climate. To many, Allerton Garden’s most splendid feature is the ever-present sound of running water, thanks to the hundreds of fountains, waterfalls, and reflecting pools. Visitors can choose between professionally led tours and a casual self-guided stroll of the grounds. The sunset tour is especially beloved by visitors. Fans of the 1992 film Jurassic Park will recognize the Moreton Bay Figs, a grove of trees featured in the movie. 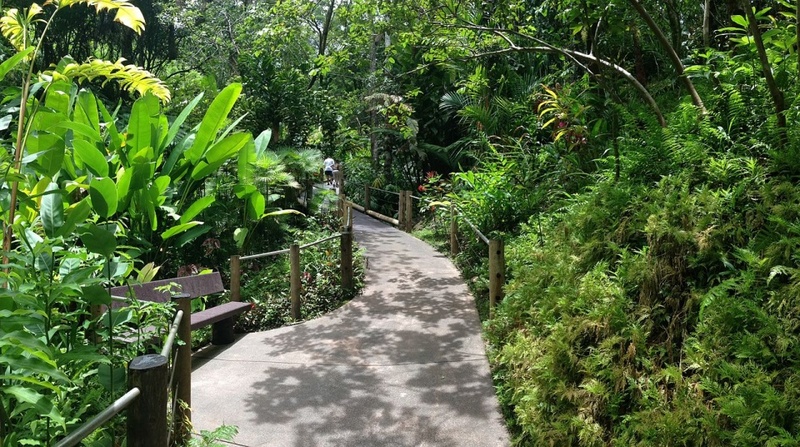 Allerton Garden/McBryde Garden is a must-see stop during your Kauai adventure. 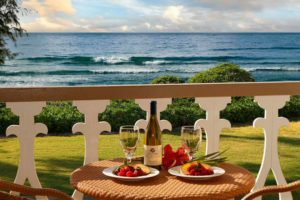 You’ll find this splendid destination conveniently located along Kauai’s Coconut Coast on the island’s eastern shore. It’s far enough from public roads to ensure a tranquil atmosphere yet close enough to the highway to enable easy access for visitors. At 30 acres in size, it’s not the largest garden on Kauai. Yet it offers plenty to enthrall even the most discriminating nature lover. Meandering footpaths lead past more than 20 examples of flowering fruit trees. Wild birds such as peacocks roam the lush grounds, adding to the scenic splendor. One of the great things about Smith Family Garden is that it’s home to Kauai’s most popular luau. You can take your time exploring the 30+ acres of tropical orchards, water features, and animal sanctuaries and afterwards enjoy a sumptuous feast and spectacular live entertainment. 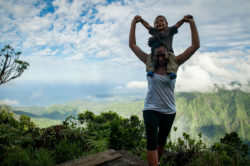 Smith family garden is set in Wailua Marina State Park, giving visitors the opportunity to sample a wide cross-section of Kauai’s natural wonders close by. Are you coming to Kauai to tie the knot or renew your vows? If so, then consider holding your ceremony surrounded by the ferns, flowering trees, and other natural wonders you’ll find At Smith Family Garden. You’ll come back with priceless memories that will last a lifetime. Be sure to visit this choice destination while you’re in Kauai. This outstanding showplace of natural and human-made beauty is a testament to the vision of its founders, Joyce and Ed Doty, who began the garden when they retired to Kauai in 1979. Today it represents one of the most magnificent examples of a managed garden found anywhere on earth. Hedge mazes, lagoons, and 120 life-sized bronze sculptures accent the more than 260 acres of tropical plant life. You could spend days wandering through the numerous footpaths that crisscross the gardens and never see everything that awaits you here. The park is a kid-friendly location, with special children-oriented events held throughout the year. Na ‘Aini Kai Garden and Sculpture Park is an endless yet ever-changing adventure, one that no visitor to Kauai should overlook. 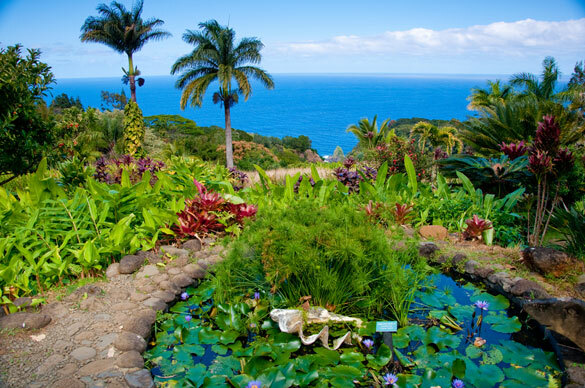 A trip to this unique garden will be a stimulating part of your Kauai vacation. The estate is the largest coffee plantation in the United States. Staff members greet every visitor with a cup of the locally grown brew. Experienced guides conduct four tours of the grounds every day of the week. They also host live roastings and other special events. You don’t have to be a coffee lover to enjoy the natural beauty and perky people waiting for you at Kauai Coffee Estate. After a full day enjoying Kauai’s gardens, there’s nothing better than coming back to a comfortable, private vacation home to unwind and relax. Why waste your money on crowded hotels or amateur innkeepers when our properties offer so much value? Browse our site and make your reservations today for best selection. We’ll see you soon in paradise.